Solimpeks and NewForm Energy have recently implemented one of England's largest hybrid collector system In the city of Chetwode Road successfully. Kemal İbiş | Solimpeks Corp. 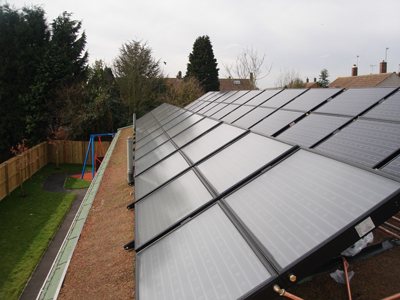 In the city of Chetwode Road, Solimpeks and NewForm Energy have built a hybrid system consist of 54 Volther hybrid collectors, which produce electricity and hot water simultaneously, for the Surrey children home, which holds a base in the outskirts of the town. The system can produce 8.000 litres of hot water per day. 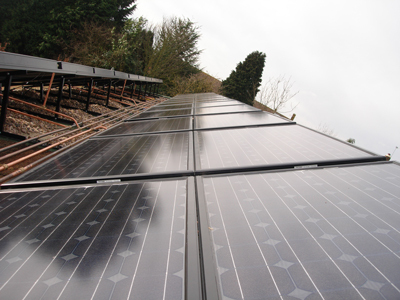 The project which was completed in May 2010 after commisioning began in February 2010, is one of the largest hybrid collector hot water and electricity installations in England to date. In this project consist of 54 pieces Volther hybrid collectors; in this series production of both electricity and hot water is done simultaneously. As for the other materials, two double pumps were installed, two expansion tanks and boilers where hot water can be stored up to 70 C degrees in the afternoon hours. Solimpeks in conjunction with themselves engineer team installed the system on a concrete roof without any damage of the roofing insulation. In this project amazing thing is will payback itself nearly in 34 months. For additional information: Solimpeks Corp.